M.T. Edvardsson’s A Nearly Normal Family is a gripping psychological thriller that forces the reader to consider: how far would you go to protect the ones you love? In this twisted narrative of love and murder, a horrific crime makes a seemingly normal family question everything they thought they knew about their life—and each other. M. T. Edvardsson is an author and teacher from Trelleborg, Sweden. He is the author of multiple novels and books for young readers in Sweden. A Nearly Normal Family is his first novel published in the United States. He lives with his family in Löddeköpinge, Sweden. "A NEARLY NORMAL FAMILY is a canny, intensely suspenseful legal thriller. A 18-year-old teenager is accused of murdering a 32-year-old man, provoking a crisis for every person close to her and challenging the commandments of the law as they confront the bonds of love and family life." 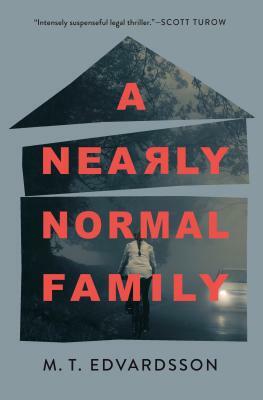 "A NEARLY NORMAL FAMILY is a brilliant thriller, another masterpiece of Scandinavian noir. It is riveting as the complex plot unfolds layer after layer and twists the well-drawn characters to a startling conclusion. This is crime fiction at its best."